Dr. Berry’s passion is to help patients find relief from pain and restore their quality of life. He specializes in “The Advanced Orthogonal Technique”, a state-of-the-art, percussion adjusting system. 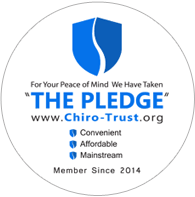 This method offers patients a gentle and precise adjustment without the conventional chiropractic “twists and pops.” Dr. Berry has the expertise to successfully treat chronic and complicated cases, many of which have been treated unsuccessfully by conventional methods. As a 4th generation Chiropractic Physician, Dr. Berry treats patients of all ages, including infants and older adults. No matter how far your health has deteriorated, he looks forward to inspiring HOPE and facilitating HEALING. Dr. Berry attended undergraduate school at LeTourneau University in Longview, Texas with majors in Welding Engineering and Automotive Technology. In 2004 he received his Doctorate from Sherman Chiropractic College in Spartanburg, S.C. Since that time he has been an Advanced Orthogonal Chiropractor. Dr. Berry and his family reside in Longview, TX. They are active members of Longview Christian Fellowship and volunteer on several advisory boards throughout the city. Dr. Berry is past president and member of the Longview Lions Club.